PEP REVIEW: National anthem music videos—how do they measure up? Dingdong Dantes and Marian Rivera (top frame) are two of the stars who took part in GMA-7’s historical interpretation of "Lupang Hinirang." ABS-CBN stars Gerald Anderson, Kim Chiu, Erich Gonzales and Enchong Dee are some of the celebrities who appear in the updated version of its music video. Some Filipinos have a tendency to take the Philippine national anthem for granted. For this reason, we applaud the efforts of TV networks to give importance to "Lupang Hinirang." The national anthem, a military march composed by Julian Felipe with lyrics by Jose Palma, has been abused (and many will agree) by youngsters who still call it "Bayang Magiliw" and by some performers who change the melody and tempo at whim, to the annoyance of the National Historical Institute. In celebration of the 113th year of Independence of the Philippines this year, ABS-CBN launched a cinematic music video of the country’s national anthem. According to StarAd Prom, the Kapamilya network chose to update its old music video, which was first released in 2006. GMA-7 released its version last year, in time for its 60th anniversary. 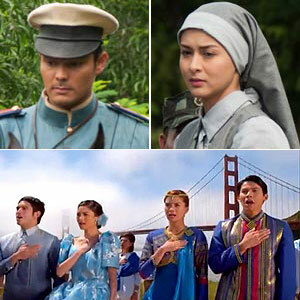 Kapuso celebrities were tasked to portray key persons in Philippine history for the historical vignettes shown in the music video. Now that rival networks GMA-7 and ABS-CBN have their own music videos of the country’s national anthem, PEP.ph asks: How do they measure up? TOURISM APPROACH. ABS-CBN’s version took the tourism approach, showcasing some of the country’s best tourist spots and festivals like the Banaue Rice Terraces, Mayon Volcano and the Pahiyas Festival in Quezon province. The star-studded video shows the Kapamilya network’s talents singing along with the musical score. Particularly eye-catching is the shot of Kapamilya male talents led by Piolo Pascual himself running along the beach all in white, carrying the Philippine flag. Incorporating elements from festivals from all over the country provides a colorful backdrop that adds to the festive theme. But as much as it is visually appealing, ABS-CBN’s version seems to place its emphasis more on presenting its roster of stars rather than imparting a message about our nation’s freedom. Even showing well-known sites from countries abroad also seems to be a placement for ABS-CBN’s The Filipino Channel. HISTORICAL APPROACH. GMA-7’s version is a two and a half minute summary of the significant events in the country’s history such as the 1521 Battle of Mactan, the martyrdom of the priests Gomburza, the Cry of Pugadlawin, Jose Rizal’s execution, and the 1986 EDSA People Power Revolution. Viewers were able to see Kapuso stars assume various identities: Aljur Abrenica as Lapu-Lapu, Dingdong Dantes as Gregorio Del Pilar, Richard Gutierrez as Manuel L. Quezon, and Marvin Agustin as Dr. Jose Rizal. Meanwhile, Marian Rivera represents a nun who took part in the 1986 EDSA Revolution. The music video received a bronze award from the Anvil Awards of the Public Relations Society of the Philippines last February. It also won the Bronze World Medal in the Music Video category of the 2011 New York Festivals World’s Best TV Programs and Film Awards. It’s practically a cheat sheet for a history final. For a student who disliked history classes with a passion, I find it a concise outline of the almost 500 years of events that made the Philippines what it is today. It took ten months of research and preparation to mount these re-enactments, so you have to appreciate the enormity of this cinematic venture. However, the video abruptly shows a group shot of GMA-7 talents and a shot of the news and public affairs anchors on the SM Mall of Asia grounds. A smoother transition could have been made to adhere to the retro concept of the video, a shot perhaps, of the celebrities in traditional formal wear singing the anthem. I’m partial to GMA-7’s version because it educates the public about key moments in Philippine history. Also, I find its production quality to be the same as that of the epic telenovelas the Kapuso network is known for. GMA-7’s historical interpretation of the national anthem leaves a powerful impact—the grandness induces goosebumps as it makes Filipinos appreciate the sacrifices of our national heroes.